When it comes to effective braking for the country’s thousands of commercial vehicles (CVs), whether on the power unit or the trailer, guaranteed performance and complete dependability should be non-negotiable qualities. For the sake of both the driver and other road users, as well as for the general public, the consequences of such large objects failing to slow down or stop in time, can be grave. It is therefore, absolutely crucial that those responsible for the service and repair of CVs specify and install premium quality components that have been manufactured to exacting specification, to ensure the required standards for braking performance and durability are maintained. Caution should therefore be taken when choosing a braking supplier, as it is not uncommon in today’s price driven market, for less scrupulous suppliers to offer braking components that have a reduced material mass. What this means is that the product will be lighter than the original equipment (OE) equivalent. For example, reducing the weight of the Brake Drums can only be done by reducing the amount of material used in its manufacture, which by its very nature will make them thinner and less robust and, in the process, significantly compromise their quality and the overall braking performance of the finished component. When it comes to brake discs, similar risks also apply, as less physical material can affect heat dissipation and cause heat build-up, which can lead to the discs failing prematurely. Manufactured in Europe, to exacting OE specification and matching in both weight and dimension, Borg & Beck CV Brake Drums provide factors, installers and fleet managers with the peace of mind that only premium quality components can bring. The range has increased to more than 130 references and, therefore, caters for all the UK’s popular truck, trailer and PSV applications, with recent additions covering BPW trailer axles, Iveco, DAF, SAF, and MAN, each is clearly marked with Borg & Beck branding and part number for full product traceability and quality assurance. To accompany the CV Drum range, Borg & Beck also offers a comprehensive range of CV Brake Discs, which, in keeping with the company’s strict brand values, provides technicians and operators with premium quality replacement components that deliver when it comes to safety and performance. The Borg & Beck CV Brake Disc range has recently extended to more than 120 references covering all popular applications, new highlights include Discs to fit Van Hool PSV, BPW axles, Volvo FL, FH, FM, and Renault Magnum DXi applications. Due to demands from operators for prolonged disc life for Scania and MAN applications, Borg & Beck has added solid discs as an alternative option to the vented versions that are currently available. Safety and performance are at the pinnacle of the brand values, therefore working closely with its ISO TS16949 accredited manufacturing partners, the team at Borg & Beck ensure that premium quality is achieved at all times and that all products are manufactured to stringent specifications. Following the manufacturing process, all discs are fully tested, by a UK testing house, to guarantee high standards are maintained even during hostile environments. Since November 2014, when the European Union confirmed the legislation, the original fitment of ECE R90 approved Brake Discs has become a legal requirement. Therefore, as a leader in the roll out of the approval process for the aftermarket, 70% of Borg & Beck Brake Discs carry the approval, ensuring high quality and peace of mind for customers. In addition, where applicable, the Brake Discs are supplied with fitting kits and benefit from an easy identification process through the Borg & Beck CV website www.borgandbeckcv.com which enables a search via competitor and OE cross-references. Finally, all Borg & Beck CV components are supplied with a 24-month, unlimited mileage warranty against manufacturing defects for total peace of mind. 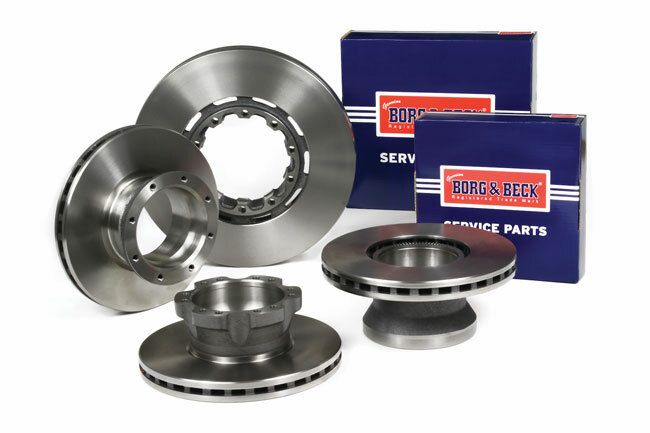 Borg & Beck, has been a reputable worldwide brand in the automotive and CV sectors for more than 100 years. Due to its engineering history, knowledge and expertise, Borg & Beck has always been associated with OE quality products, which means it’s a brand that can be truly depended upon.